Sync your iOS devices with top 3 iPhone to iPhone transfer solutions. Transfer photos, music, videos and contacts from old iPhone to new iPhone via iCloud, iTunes and your all-in-one iPhone manager. iCloud is an online cloud service launched by Apple in 2011. It offers 5GB free storage for new users to upload iOS data for backup wirelessly. 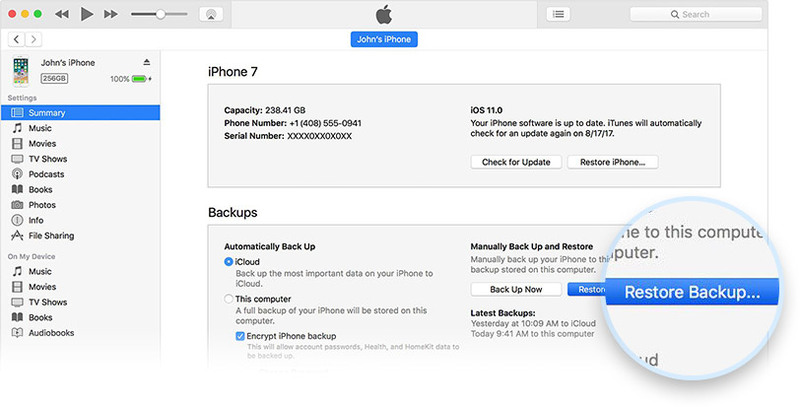 If you have already backed up your iPhone to iCloud, then the iCloud backup will make it easy when you set up your new iPhone and move iPhone data from one to another. Here are the steps of restoring data from old iPhone to new iPhone via iCloud. 1. First, make sure there is an available Wi-Fi signal. 2. Go to Settings, click on Your Name, and tap iCloud. 4. Turn on your new iPhone and the Hello screen will pop up. Remember, you need to erase all the contents if you have already set up the new iPhone before the restore begins. 5. 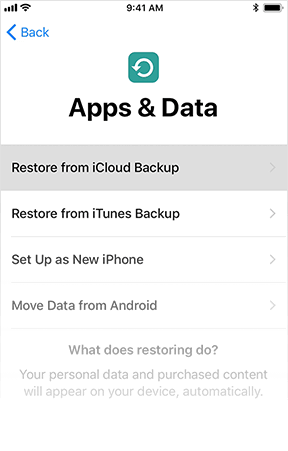 Follow the onscreen setup steps until reaching the App & Data screen, then tap Restore from iCloud Backup. 6. Sign in your iCloud account. 7.Choose the backup in terms of its date and size to restore to your new iPhone and then the transfer will start. 8. Wait until the process gets finished and check whether the data restore is successful on your new iPhone. 1.iCloud relies on the network (Wi-Fi) to provide service to its users. Depending on the network environment, it may cause data loss when transferring data via iCloud. 2.You only get 5GB of free iCloud storage for backup. If you need more iCloud storage, you can upgrade the plan, the price starts from $0.99/mo. 3.There is a chance that you confront with security issues and your personal information gets leaked, because you store your data to a third party platform. iTunes is a popular media player and application developed by Apple, it is mainly used to manage and back up iOS data including iPhone photos, digital music, video files and more. Let’s see how to transfer the data from your old iPhone to new iPhone with iTunes. 1.Connect your iPhone to PC and launch iTunes. 2.If a notice pops up to ask for the pass code or remind you to Trust This Computer, just follow the onscreen guide. If nothing pops up, skip this step. 3.Select your iPhone when appearing on iTunes. 4.Choose the data of the old iPhone you want to backup and click on Back Up Now. 5.Pull out the old iPhone and connect your new iPhone to PC. 6.Open iTunes and click on Trust This Computer if needed. 7.Select your iPhone and go to the control panel where you can find the latest backup including its date and time. 8.Choose a backup and click on Restore Backup. Wait until your device gets restarted. In terms of iPhone to iPhone transfer, iTunes doesn’t allow you to transfer, backup or restore certain files and categories. Besides, iTunes backups will not contain files and contents synced to your iPhone, like music files, videos and etc. iCloud and iTunes are feasible ways to backup and restore data across iOS devices. However, there is a much better method available – IOTransfer. Your all-in-one iPhone manager helps transfer data from old iPhone to new iPhone in the easiest way. Want to move your photos from the old iPhone to new iPhone for they are too precious to lose? Don’t worry, follow the guide below and you will know the most convenient way to restore photos on your new iPhone. 1.Install and launch IOTransfer, connect your old iPhone to PC and wait until it’s recognized. 2.Click on MANAGE on the top, go to Photos in the left list. Select the photos you want to transfer to the new iPhone and click on Export. Preset an output folder and continue to start the transmission. 3.After the transmission is done, make sure you can find the photos from the old iPhone in the folder preset before. Now, pull out your old iPhone and connect the new one to PC. 4.Still, go to MANAGE, choose Albums under Photos, and click on “+Create” to create a new album. 5.Go to the album you just created, and click on “Import”. Select the photos from the old iPhone and start the transferring process. Within only a few seconds, you can find your photos in the created album on your new iPhone. If you like enjoying music on the go but don’t know how to save your music collection from old iPhone to new iPhone, follow the tips below! 1. Install and launch IOTransfer, connect your old iPhone to PC via a USB cable, and wait till it’s recognized. 2. Click on MANAGE on the top, in the opened panel, find Music in the left list and click on it. 3. Select the music you want to transfer to the new iPhone and click on Export, preset an output folder on PC and start the transferring process. 4. After finished, pull out the old iPhone from PC and connect the new one. After it’s recognized, go to MANAGE again. 5. Click on Import and choose the music in the folder you preset before to import them to your new iPhone. More than a regular handset, iPhone is also a reliable video player which means you may have stored quantities of videos on your iPhone for an offline visual experience. But what if you changed a new iPhone and had no ideas how to deal with these valuable videos? Keep reading and soon you will figure it out. 1.Install and launch IOTransfer, connect your old iPhone to PC via a USB cable and wait until it is recognized. 2.Click on MANAGE on the top, and then go to Videos on the left list. Select those videos you need to move to the new iPhone and click on Export. Preset an output folder on PC and begin the transfer. 3.After the transfer is done, remove your old iPhone from PC and connect the new one. Still, after recognized, go to MANAGE. 4.Hit Videos and click on “Import”. Choose the videos you previously saved to move them to the new iPhone. How to recover your contacts after changing a new iPhone? Briefly go through the simple steps below and you will get the very gist! 1.Install and launch IOTransfer, connect your old iPhone to PC via a USB cable and wait until it gets recognized. 2.Go to MANAGE, hit Contacts in the left list and click on Export. Choose an output folder on PC for the contact backup. Then, the transfer process gets started. 3.After finished, remove your old iPhone from PC and connect your new iPhone. After recognized, click on MANAGE again. 4.Choose Contacts and click on Import. Then select the contacts from your old iPhone in the folder you preset before and start the contact transferring process. Within seconds, you can find the contacts in your new iPhone’s contact list.